USA 3 Panama 0. Goals: Mihailovic (Baird) 40, Zimmerman (Lima) 80, Ramirez (Lewis) 88. Seven players made their USA debuts in Coach Gregg Berhalter's first game at the helm -- a 3-0 win over Panama, also a team in the midst of rebuilding -- and for the most part the debutants impressed. Zack Steffen did well to stay awake in the first half, when the only Panama shot was a weak one straight to him. He made a super diving save on Edson Samms' 55th-minute close-range shot, blocking it with his left arm. Sean Johnson replaced Steffen in the 74th minute. Left back Daniel Lovitz took advantage of a tame Panama offense and looked like a midfielder for most of the game, making mostly accurate passes. Captain Aaron Long held down the fort. 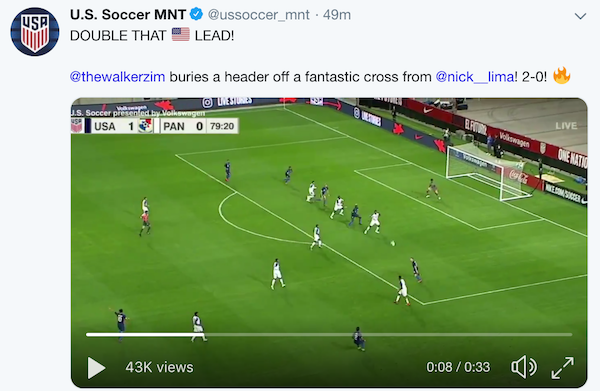 Walker Zimmerman hit a superb long pass to Corey Baird late in the first half, and scored the USA's second goal with a header. Veteran Michael Bradley, composed and efficient, left no doubt that he'll be part of the rebuilding project. He defended well in front of the backline and hit crisp passes that helped the USA dominate in possession. Nick Lima helped create the first U.S. goal and served as a right back when needed. He won the ball with a strong sliding tackle and hit a perfect cross to set up Zimmerman's goal for the 2-0 lead. Cristian Roldan helped the U.S. midfield rule the game but without any notable attacking contributions. Left winger Jeremy Ebobisse was impaired for much of the first half after a head clash with Francisco Palacio. The USA may have better off had he been subbed earlier instead of playing short-handed during his sideline treatments. Corey Baird, who assisted on Djordje Mihailovic's goal, frequently troubled Panama's back line while attacking from the right flank. Gyasi Zardes, unmarked, headed high and wide on a chance that should have given the USA a lead in the 9th minute. He missed another header in the 37th minute. In the second half, he shot straight to keeper Eddie Roberts from close range and skied the rebound. Djordje Mihailovic constantly made himself available by moving into midfield and, although he rushed a few passes that went astray, he generally did well with the ball and from the get-go had the Panamanians wary. The youngest American on the field, he scored on a sharp strike that gave the USA a 1-0 lead. And although none led to a goal, Mihailovic hit good corner kicks. Sebastian Lletget replaced Mihailovic in the 63rd minute and a minute later dribbled through the defense to set up Zardes for a solid chance. Jonathan Lewis had several nice touches on the left wing and roasted Edgar Gondola to serve up Christian Ramirez's tap-in to make it 3-0. Goalkeeper Sean Johnson replaced Steffen in the 74th minute saved an easy long-range shot a minute later and snagged a high through ball securely. TRIVIA: Five debutants in the starting lineup -- Nick Lima, Daniel Lovitz, Corey Baird, Jeremy Ebobisse, Djordje Mihailovic -- was the most since five players earned their first caps in a 2-0 win over Canada in 1992: Cobi Jones, Joe-Max Moore, Brad Friedel, Mike Burns and Mike Lapper, all of whom would make the USA's 1994 World Cup squad. USA -- Steffen (Johnson, 74); Lima, Zimmerman, Long, Lovitz; Bradley (Trapp 84); Roldan, Mihailovic (Lletget, 62); Baird (Arriola, 75), Zardes (Ramirez, 84), Ebobisse (Lewis, 66). Panama -- Roberts (Mosquera, 74); Benítez (Anderson, 46), Escobar, Góndola, Palacios; Cañate (Orelién, 65), Carrasquilla (Harvey, 46), Walker (Botello, 71), Browne (Samms, 46); Sinclair, Arroyo. 29 comments about "USA-Panama: Men's Friendly Player Ratings". A tame game; more like a scrimmage. USA had numerous opportunities that it failed to exploit, i.e., failed to turn them into shots, let alone shots on goal. Michael Bradley had plenty of room on attack and took useful advantage of it. However, he was slow and passive in 1 v. 1 defense. Bob Ashpole, January 28, 2019 at 1:04 a.m.
beautiful game replied, January 28, 2019 at 9:37 a.m.
B.A. if you liked what you saw than you deserve a mediocre team performance against a minnow. Bob Ashpole replied, January 28, 2019 at 10:14 a.m.
Hal Barnes, January 28, 2019 at 1:38 a.m.
still of the school that no player involved in the T&T debacle except for Pulisic and Edlyn should ever wear the USA uniform again. That includes Bradley. Sorry if this offends you. Toby Rappolt, January 28, 2019 at 2:11 a.m.
frank schoon, January 28, 2019 at 10:20 a.m. I could only watch about the 32 min. of this game this morning, may watch a little more later, but here is what noticed. Neither team seems to using the space on the flanks in the last 20meters, the attack all seems to funnel into the middle. Zardes, is forced to play in an unnatural position with his back to the goal which is not his strong point. The front line when tracking back into their own half just ball watch instead plan ahead by looking forwards to what space to run into in a possible transistion. The heads colliding at midfield nearthe sidelines tells you the players had no clue of their presence of where they were on the field. This incident is something you would see in a select 12year old game. These are injuries shouldn't happen, especially when you time to see the ball coming and know where your'e at on the field. You never a nice give and go pass between MB and a midfielder or upcoming defender it's just not astandard play. Tactically I wasn't impressed with either team in how they take advantage at the moment of play. For example, the right centerback is covering a man as well as the rightback, then I expect the attacker who the rightcenter back is covering to make a DIAGONAL run towards toward to sideline forcing the right centerback out of their position, thereby creating a space for an attacking midfielder to run into space in front of the goal. Both failed to even initiate an attempt. Panama has no defense, no offense. Bob Ashpole replied, January 28, 2019 at 4:52 p.m. I saw the same things, but I was still happy because the coach had the team more compact and people were regularly showing in the gaps between lines and receiving passes. Zardes is not an international quality CF. I believe he is the "stand in" for someone else to come later. Ebboisee is a CF and was playing out of position at LW. I was impressed with his first performance. I too was concerned about the attacking play on the wings from the wingbacks or whatever label you want to give them. Especially the left side. There was several times when he had an easy opportunity for a positive pass to an open winger but passed back instead. Then one time he tried an easy pass and it went out of bounds. In the first half I was just as concerned with the right side, but he did make one good (but risky) play in the second half. I say risky because he left his feet to make a tackle. In the second half I saw the left wingback make a couple of positive passes, but nothing to brag about. In the end it is a friendly against the No. 71 team by (believe it or not) the No. 25 ranked team. I was more interested in seeing how the team was coached then watching the players. I also was not impressed by the score. Zardes alone badly missed two headers that should have been at least put on frame. But he isn't really a CF. Some other people made stupid selfish decisions as opposed to smart selfish decisions. Just wasted possessions. My speculation about the flank play is that the wingers were supposed to be slightly inside to leave room for the wingbacks to run forward, except that they weren't running forward enough to make it effective. Bob Ashpole replied, January 28, 2019 at 4:57 p.m. I don't know if it was just coincidence, but I thought we were playing a bit like Mexico. frank schoon replied, January 28, 2019 at 5:03 p.m.
You may be right about Zardes that he's just a stand-in in the middle. Zardes does not have the quickness or movement or turn to play CF. Bob Ashpole replied, January 28, 2019 at 5:14 p.m.
Saturday's game against Costa Rica should be a tougher match. beautiful game replied, January 28, 2019 at 9:58 p.m.
Frank S., of all people, you still have faith in Zardes...I wrote him off 2-years ago; big, slow, technically mediocre, and low soccer IQ...he's dead weight on the USMNT...matter of factly, he was dead weight in the MLS play-offs. Bob Ashpole replied, January 29, 2019 at 1:25 a.m.
BG, I didn't see anything in Frank's posts to merit that comment. I guess you are implying that a statement that Zardes is unsuited for the CF position is somehow promoting Zardes? frank schoon replied, January 29, 2019 at 10:39 a.m.
BG, Bob's explanation is exactly what I meant. I'm not a fan of Zardes, but my comments are strictly related to the game at hand. I read so often about players described as having low soccer IQ, a criticism of all the players if I would compare them to the Ajax players. It is better to criticize what an indidual player does wrong, and explain the scenario, which I try to do, instead of commenting on the playing IQ for that doesn't get you anywhere...it is what it is. If you look at MB all his passes go to the feet never in front of the player in order to speed up the tempo. Look at his one-touch passes to the 3rd man which is always to the feet. Instead what he should try to do is to make a one touch pass behind the defender, diagonally, allowing his teammate to make a run behind the blind side of the defender. MB contribute to one tempo through the manner of his passes, likewise he moves in one tempo and he make teammates fit his tempo which at times needs to be done, but that's all he knows..
Bob Ashpole replied, January 29, 2019 at 2:28 p.m. I am actually encouraged by your comments. The way I see it is that you know enough that you can nearly always find ways to improve play. As for Bradley and passes to space, he does make long through passes occassionally to put someone through the opponent's back line. For shorter passes he always plays to feet, but I figured that was how he was coached to play. I am smart enough to know if the teammate is standing still you can still force him to turn and move in a direction you choose by where you put the pass. I used to do it all the time when a player didn't realize that there was no one behind him or to lead him away from pressure. And that was in low level adult rec play. Pros ought to know that too. That is why I think he is playing how he is told. frank schoon replied, January 29, 2019 at 3:37 p.m.
Bob, that he plays the way he's told, I not sure about that. Perhaps it is better to say he plays the ways he's learned it. Cruyff in his first year as coach made his players especially the ones around midfield to pass in front of the player in order to increase the tempo, giving the opponents less time to react. Richard Witsche , who later played for Barcelona, complained about his lead pass going out of bounds especially those that are more squarer for you have to take into account the player's speed ,space and the opponent. Witsche wasn't used to playing at that level but he learned. Ofcourse, MB should also pass to the feet but he does it even in his own safe areas of his own backfield directly to a defenders feet. What MB does is too simple and after all these years of playing, and all the experience he picked up in Europe, he's still just meat and potatoes type of passer. He's what we call in Holland describe as just going through motions ,just doing his duty, nothing more ,nothing less..
Bob Ashpole replied, January 29, 2019 at 4:23 p.m.
You may well be right, but I prefer to be optimistic and hope for change. Either way the more important question is how does the new coach want to play. I was looking for coach's intent rather than perfect execution of a game plan. What I saw in this match was team tactics that were closer to Dutch Style principles then what we saw recently. Specifically a more compact 343 attacking shape, emphasis on good positioning, exploiting the gaps between the lines, controlling the center of the field, and pressing high to win the ball back high up the field. Of course this is just against a weak team. My hope though is that the coach wants to play this way against better teams too. frank schoon replied, January 29, 2019 at 4:51 p.m.
We'll see how they play against Costa Rica and hope CR will come with a good team ...It is very tough to give opinion about this team, especially in the beginning stages. The 343 dutch style you mention is without the triangles. I like to see more of Martinez and how he plays for the goal he scored could have been done by anybody.. I also like to see a little more of Lewis who played left wing. Kevin Leahy, January 28, 2019 at 10:54 a.m.
Pressure on the ball was encouraging & movement off the ball. When you think of all the uncapped players it, was decent and the second half was better. Will look forward to seeing how they assimilate the other players. Hope that no one was expecting Brazil. John Richardson, January 28, 2019 at 12:33 p.m.
clayton nissan, January 28, 2019 at 12:34 p.m.
Cant believe M.Bradley is still in the line up. So many mental mistakes. R2 Dad replied, January 28, 2019 at 3:39 p.m.
My issue with MB is that he is a slow thinker, in a position that sets the pace of the team. He might have been able to get away with this in Serie A, which has a slower pace than other leagues. But the international game is ill-suited to old players who aren't thinking 2 steps ahead. Yes, the 6 must be able to slow down the pace when a change is necessary, but I'd argue both McKinnie and Adams are already better 6s than MB. Watch Adams and his 1 touch passing, and then watch MB. To counter this ball and chain, GB hasn't made MB the captain, but this is just a contrivance. When you're so much older than everyone the captain's armband does not then serve its purpose. Watch the ESPN 60 seconds clip--MB is still giving the on-field talk to rally the troops. It would have been better not to start MB--it shouldn't be his team anymore. Wooden Ships replied, January 28, 2019 at 4:55 p.m. I agree R2 and would add a couple more reasons why MB’s days should be over with the Nats. No personal disparagement, just soccer opinions. Bob Ashpole replied, January 28, 2019 at 5:07 p.m. I don't know what the complaint is. The coach said Bradley was the best skilled player in that camp. What he didn't do was compare him to others in the pool not at the camp. I don't see how you can fault a coach for selecting the best available. The press has been reading more into what the coach said, but look at what the coach said, not the press. I personally think Bradley is going to be around awhile becuase we need at least 2 deep lying CMs and I don't hear anyone saying there are two better than Bradley. Remember Will Trapp was in the camp and you cannot believe the coach doesn't know well how Trapp plays. For international play Trapp needs to be better on positioning off the ball, perhaps he will get better. John Soares, January 28, 2019 at 12:37 p.m. So all the Brazilian players involved in a 7-1 embarrassment should have been shot?! Everybody has an occasional bad game. Yeah, T&T is not Germany, but then USA is not Brazil. Right Winger, January 28, 2019 at 4:54 p.m. I dont understand Zardes and Bradley being there. No one could be rated by playing this team. Panama was more disorganzied than we were against T&T. Time will tell. We possessed the ball 66% percent of the time and I think we had 6 shots on goal. R2 Dad, January 28, 2019 at 9:28 p.m. I don't know who Christian Ramirez is, but since he is 27, plays for LAFC and this is his FIRST CAP, maybe USSF should be asking themselves where has this guy been the past 10 years. I don't know if he's any good, but did he just grow 5 inches in the past year and thus become "acceptable" as a CF option? To me, this guy looks like a prime candidate for "one of the unknown hordes of players USSF ignores in favor of existing marginal-yet-known players". Golf clap, USSF voting members who approve of the status quo and our super-lame "scouting" system. When we say there are 10 more guys just like this out there, this is EXACTLY what we mean. Go find 10 more guys just like this who are busy slipping though the cracks! D'oh! Wooden Ships replied, January 28, 2019 at 9:57 p.m.
R2, it’s been this way for many, many years. And, we’ve had many skilled, imaginative #10’s, soft footed field players too that have not been on the inside. beautiful game, January 28, 2019 at 10:10 p.m.
For me, being acceptable or a back-up on the USMNT is a terrible attitude. Either players deserve to be on the squad or they don't. Take a look at the top 20-NTs and every player on the squad has talent and brings something to the team table. I suggest Zardes and Bradley are dead weight and for the coaching staff to stick to their tactical plan with players that are capable to deliver efficacy and consistency on the pitch.